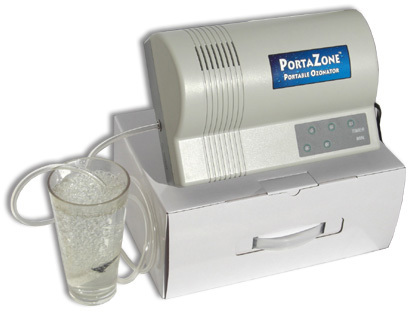 The Portazone Ozonator produces ozone at a rate of 250 mg per hour using corona discharge. Timer buttons set the Portazone to automatically turn off after 5, 10, 15, 30 or 60 minutes of run time. The Portazone runs on 110 Volt AC., 18 Watts, .15 Amps. It weighs 5.5 lbs and measures 12 x 8 inches wide x 4.25 inches high. Ozonate water or ozonate olive oil with the attached ceramic diffuser. The Portazone ships via UPS Ground directly from the manufacturer. All sales are final. No returns after the unit has been opened.